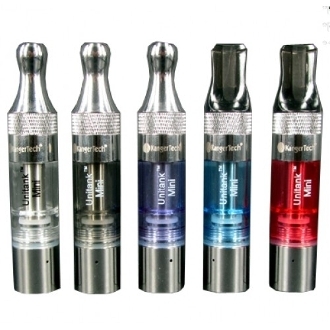 The Kanger Mini Unitank is the first bottom coil clearomizer to feature filling from the top. The unique design boasts two chambers inside the kanger unitank. These tanks are separated by a spring activated seal that seals off the bottom of the tank while refilling. Another great feature of kanger unitank mini is that they are rebuildable. This means you can change out the coil wicks and reuse the kanger unitank over and over. Not only that, these tanks are compatible with the replacement coils for the kanger protank and Evods, as well as their own. Turn the mini unitank upside down and unscrew the base assembly cap from the bottom of the tank. Reinstall the base assembly into the mini unitank. Let the mini unitank sit for a few minutes when first filling with liquid, this will allow the liquid to absorb into the coil wicks. Firing the kanger mini unitank with a dry coil can cause burning of the wicking material and possibly ruin the coil. NOTE: We recommend letting the liquid pass below the seal before refilling. This will help avoid any flooding or gurgling.